Microvascular decompression (MVD) is a surgery to relieve abnormal compression of a cranial nerve causing trigeminal neuralgia, glossopharyngeal neuralgia, or hemifacial spasm. MVD involves opening the skull (craniotomy) and inserting a sponge between the nerve and offending artery triggering the pain signals. Medications often provide initial relief, but when drugs become ineffective or cause side effects, MVD is an option. What is microvascular decompression (MVD)? MVD is a surgical procedure to relieve the symptoms (pain, muscle twitching) caused by compression of a nerve by an artery or vein. 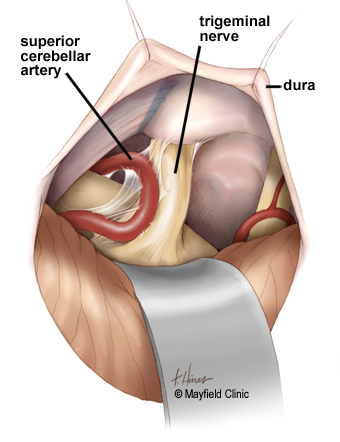 Surgery involves opening the skull (craniotomy) and exposing the nerve at the base of the brainstem to insert a tiny sponge between the compressing vessel and the nerve. This sponge isolates the nerve from the pulsating effect and pressure of the blood vessel. Trigeminal neuralgia is an irritation of the fifth cranial nerve causing severe pain that usually affects one side of the face, normally in the forehead, cheek, jaw, or teeth (Fig. 1). To treat trigeminal neuralgia, a sponge is placed between the trigeminal nerve and the superior cerebellar artery or a branch of the petrosal vein. By removing the compression, the painful symptoms are relieved. Figure 1. Trigeminal neuralgia can be caused by an artery or vein compressing the trigeminal nerve root as it originates at the brainstem. Because MVD involves the use of general anesthesia and brain surgery, patients with other medical conditions or who are in poor health may not be candidates. MVD is not successful in treating facial pain caused by multiple sclerosis. Because of the low risk of hearing loss, MVD may not be suitable for patients who have hearing loss in the other ear. You will typically undergo tests (e.g., blood test, electrocardiogram, chest X-ray) several days before surgery. In the doctors office you will sign consent forms and complete paperwork to inform the surgeon about your medical history (i.e., allergies, medicines, anesthesia reactions, previous surgeries). Discontinue all non-steroidal anti-inflammatory medicines (Naproxin, Advil, etc.) and blood thinners (coumadin, aspirin, etc.) 1 week before surgery. Additionally, stop smoking and chewing tobacco before and after surgery because these activities can cause bleeding problems. Wash your hair with Hibiclens® (chlorhexidine) antiseptic soap for 3 consecutive days prior to surgery. No food or drink is permitted past midnight the night before surgery. Patients are admitted to the hospital the morning of the procedure. You will meet with a nurse who will ask your name, date of birth, what procedure you’re having, and the side of your facial pain. They will explain the pre-op process and discuss any questions you may have. An anesthesiologist will meet with you and explain the effects of anesthesia and its risks. They will place an intravenous (IV) line in your arm and then transport you to the operating room. There are 5 steps of the procedure. The operation generally takes 2 to 3 hours. In the OR room, general anesthesia is administered while you lie on the operating table. Once asleep, your body is rolled over on its side and your head is placed in a 3-pin skull fixation device, which attaches to the table and holds your head in position during the procedure. Next, the area behind your ear is prepped with antiseptic. A hair-sparing technique may be used, where only a 1/4-inch wide area along the proposed skin incision is shaved. A 3-inch curved skin incision is made behind the ear. The skin and muscles are lifted off the bone and folded back. Next, a 1-inch opening is made in the occipital bone with a drill (Fig. 2). The bone is removed to expose the protective covering of the brain called the dura. The dura is opened with surgical scissors and folded back to expose the brain. Figure 2. 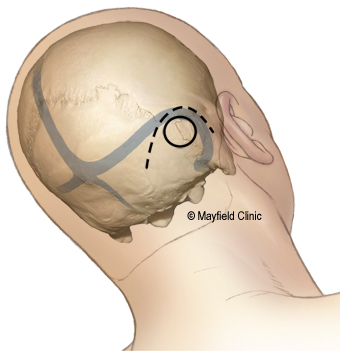 A skin incision is made behind the ear (dashed line) and a 1-inch craniectomy (solid line) is made in the skull. Retractors placed on the brain gently open a corridor to the trigeminal nerve at its origin with the brainstem. The surgeon exposes the trigeminal nerve and identifies any offending vessel causing compression (Fig. 3). 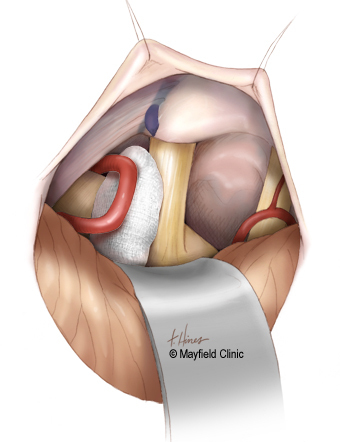 The vessel and nerve are often restricted by thickened connective tissue that must be dissected free with scissors and knife. Figure 3. The superior cerebellar artery is adherent to the trigeminal nerve causing compression and painful trigeminal neuralgia attacks. The surgeon cuts an appropriate size of teflon sponge and inserts it between the nerve and the vessel (Fig. 4). Sometimes a vein is adherent to the nerve and causing compression. In these cases, the vein is cauterized and moved away. Figure 4. A sponge is inserted between the nerve and the blood vessel causing compression. Once the sponge is in place, the retractor is removed and the brain returns to its natural position. The dura is closed with sutures and made watertight with tissue sealant. Since the bone opening is very small, it is not replaced. Instead, a titanium plate covers the skull opening and is secured with tiny screws (Fig. 5). The muscles and skin are sutured back together. A soft adhesive dressing is placed over the incision. Figure 5. 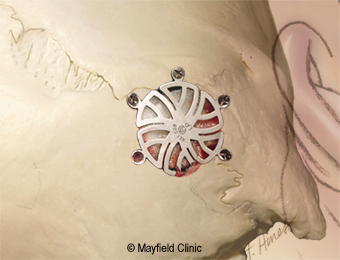 A circular titanium plate secured with screws covers the craniectomy made in the skull. After surgery, you'll be taken to the recovery room where vital signs are monitored as you awake from anesthesia. Next, you are transferred to the intensive care unit (ICU) for close observation overnight. You may experience some nausea and headache after surgery; medication can control these symptoms. When your condition stabilizes, you'll be transferred to a regular room where you'll increase your activity level (sitting in a chair, walking). In 1 to 2 days you'll be released from the hospital and given discharge instructions. Patients taking anticonvulsant or pain medication for trigeminal neuralgia prior to surgery will be weaned off the medications according to a schedule to decrease risk of withdrawal and side effects. After undergoing a craniotomy, headaches are expected; after surgery, pain may be managed with narcotic medication. Because narcotic pain pills are addictive, they are used for a limited period (2 to 4 weeks). Also, their regular use may cause constipation, so drink lots of water and eat high fiber foods. Laxatives (e.g., Dulcolax, Senokot, Milk of Magnesia) may be bought without a prescription. Thereafter, pain is managed with acetaminophen (e.g., Tylenol). Ask your surgeon before taking nonsteroidal anti-inflammatory drugs (NSAIDs) (e.g., aspirin; ibuprofen, Advil, Motrin, Nuprin; naproxen sodium, Aleve). NSAIDs may cause bleeding and interfere with bone healing. Do not drive after surgery until discussed with your surgeon and avoid sitting for long periods of time. Do not lift anything heavier than 5 pounds (e.g., 2-liter bottle of soda), including children. Gradually return to your normal activities. Fatigue is common. An early exercise program to gently stretch the neck and back may be advised. Walking is encouraged; start with short walks and gradually increase the distance. Wait to participate in other forms of exercise until discussed with your surgeon. You may shower and shampoo 3 to 4 days after surgery unless otherwise directed by your surgeon. Sutures or staples, which remain in place when you go home, will need to be removed 7 to 14 days after surgery. Ask your surgeon or call the office to find out when. An incision that shows signs of infection, such as redness, swelling, pain, or drainage. If you are taking an anticonvulsant, and notice drowsiness, balance problems, or rashes. Decreased alertness, increased drowsiness, weakness of arms or legs, increased headaches, vomiting, or severe neck pain that prevents lowering your chin toward the chest. MVD is highly successful in treating trigeminal neuralgia (95% effective) with a relatively low risk of pain recurrence (20% within 10 years). The major benefit of MVD is that it causes little or no facial numbness compared to percutaneous stereotactic rhizotomy (PSR). No surgery is without risks. General complications of any surgery include bleeding, infection, blood clots, and reactions to anesthesia. Specific complications related to a craniotomy may include stroke, seizures, venous sinus occlusion, swelling of the brain, and CSF leak. The most common complication related to MVD is nerve damage, which varies depending on the nerve being treated; these include hearing loss, double vision, facial numbness or paralysis, hoarseness, difficulty swallowing (dysphagia), and unsteady gait. Taha JM, Tew JM Jr: Comparison of surgical treatments for trigeminal neuralgia: Reevaluation of radiofrequency rhizotomy. Neurosurgery 38:865-871, 1996. McLaughlin MR, Jannetta PJ, Clyde BL, Subach BR, Comey CH, Resnick DK: Microvascular decompression of cranial nerves: Lessons learned after 4400 operations. J Neurosurgery 90:1–8, 1999.
craniotomy: opening made in the skull. cerebellum: part of the brain responsible for balance and muscle control for movement. dysesthesia: troublesome or bothersome numbness. dura mater: a tough, fibrous, protective covering of the brain. hemifacial spasm: an irritation of the seventh cranial nerve (facial nerve) causing involuntary contraction of the muscles on one side of the face, also known as tic convulsif. Can sometimes cause pain behind the ear and loss of hearing. glossopharyngeal nerve: a nerve originating in the brain that supplies feeling and movement to the tongue and throat. glossopharyngeal neuralgia: an irritation of the ninth cranial nerve causing pain at the back of the throat. neurogenic keratitis: inflammation of the cornea. percutaneous: by way of the skin (e.g., injection). rhizotomy: cutting or destroying of a group of cells. 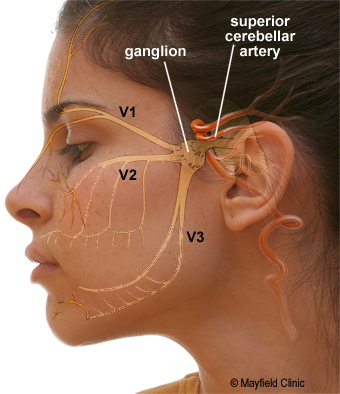 trigeminal nerve: a nerve originating in the brain that supplies feeling and movement to the face. The trigeminal nerve has three divisions: ophthalmic, maxillary, and mandibular. trigeminal neuralgia: an irritation of the fifth cranial nerve causing severe pain that usually affects one side of the face normally in the forehead, cheek, jaw, or teeth. At Mayfield, our approach to facial pain is grounded in compassion and personalized care. Our neurosurgeons are experts at diagnosing the various types of facial pain, including trigeminal neuralgia, hemifacial spasm, glossopharyngeal neuralgia, and cluster headache. We are one of the few centers to offer all available treatment options: microvascular decompression, percutaneous rhizotomy, and radiosurgery. Each year we treat more than 150 people with facial pain and perform about 60 microvascular decompression surgeries. This is 'Flash' presentation and may not play in all browsers.